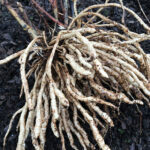 Ulluco (Ullucus tuberosus) are exquisite looking edible Andean root tubers and are members of the plant family Basellaceae which includes Malabar spinach. After the potato it is one of the most widely consumed of the Andean tuber crops, but is almost unknown outside the Andean region where it is grown. 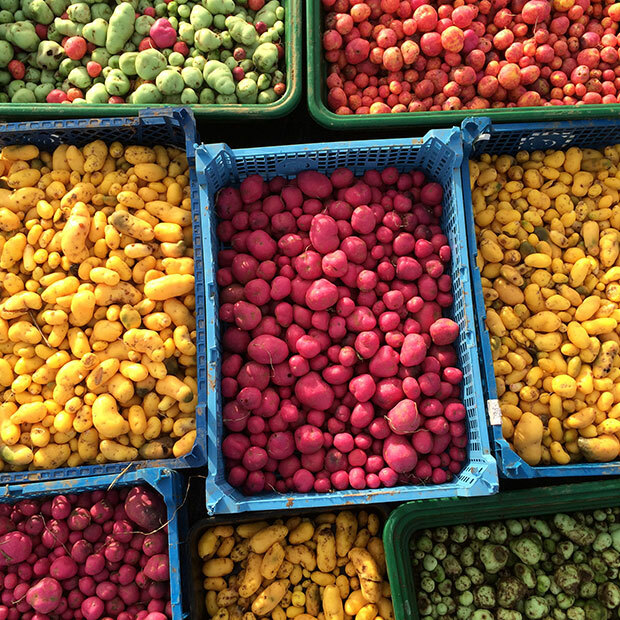 Ulluco has many varieties and colours such as the vivid green Ravelo Lisa, the mottled red and yellow Pica de Pulga, Round purple, Chugua Roja, Colombian Long Red, Long Yellow, white spotted, Cusco Market ( an orange variety with pink flecks) and many more. They are found in Colombia, Peru, Ecuador, Bolivia, Chile, Argentine and Venezuela and are known also as Papa Lisa, Olluco, Ruba, Chugua and Melloco. They need a long growing season of 6-7 months to produce a reasonable yield, and although they are grown in a similar way to a potato require narrower conditions in which to thrive. As a rule they are started off under cover in March and harvested end of November through to mid December. The plants produce edible succulent leaves that can have a spread of about 90 cm and 35-40cm in height. Each plant produces a number of small, medium and large tubers ranging from approximately half an inch to 3 inches (1.25cm to 7.5cm). The largest being the size of a new potato. Tuber formation starts in September triggered by the Autumn equinox and shortening days. They have an earthy taste similar to beetroot but with a firmer texture. Their earthy taste comes from the fact that they contain Geosmin, and levels vary in each variety. They are high in antioxidants and the smaller tubers can be eaten raw, being crunchy, the larger ones need to be cooked as they are mucilaginous when un-cooked. No need to peel, just wash and cook. Ulluco is very much an experimental crop outside of its native region of South America. Having spent several thousand years happily growing on the high slopes of the Andes, we are asking a lot of these tubers to produce in low land conditions and very different climates. We are lucky in the South West of England to have a long mild growing season and the Ulluco have done well for us here. If you want to try growing Ulluco yourself, you need to be aware that results can vary enormously depending on your location and how early your winter frosts arrive. They are also a crop that needs a bit of horticultural skill, nurturing the plants through their first months and protecting them at the end of the growing season. Keep seed tubers in slightly damp compost in a cool dark place and check regularly for signs of sprouting. What you don’t want to happen is for your tubers to produce spindly sprouts in the dark as these will be fragile and snap off. Once your tubers have started to show signs of sprouting it is time to bring them out of storage and start them off under cover. Pot them up in individual pots or place a bunch of tubers together in a tray. Cover with damp compost with the growing sprouts just at the surface. 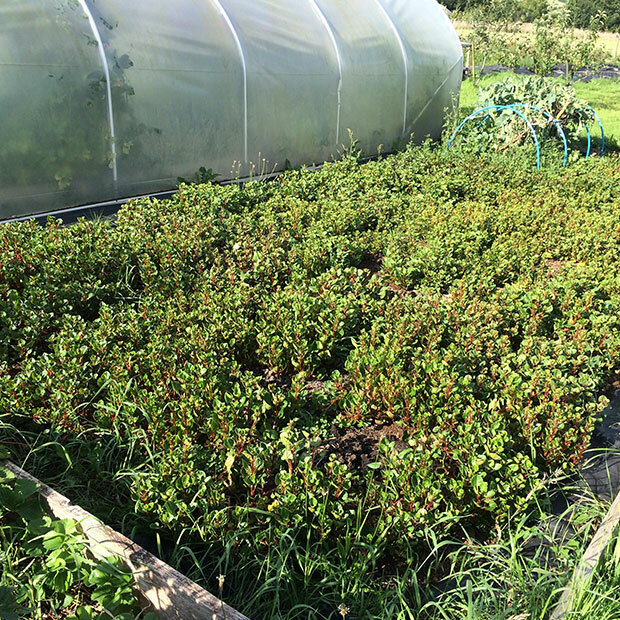 You need somewhere warm and light like a green house or polytunnel, but keep an eye on night time temperatures as young growing shoots are vulnerable so you may want to bring them indoors at night or cover with fleece even if they are under cover. Starting them off this way means you give them a good couple of months growing time before planting out mid to end of May. As they need 6-7 months to produce a good yield, starting in March is ideal to extend the growing season. You will see small fleshy leaves appear and by the end of April they should be a few inches tall. Keep the compost damp while they are growing. Once all risk of frost has passed, it is time to plant your Ulluco outside. Be careful transplanting out of the pots and trays as their stems can easily snap off from the tuber. Plant at a depth roughly equal to the diameter of the tuber in rows about 40cm apart. We allow 30cm between each plant as this gives room for the sprawling habit of the stems and leaves. The space between the plants will look a little bare initially but will gradually be covered. Soil: Ulluco likes loose light soils that are well cultivated and have had organic matter added. It does like moderately acidic soil but will grow in a range of soil types. We have found that Ulluco grows well following on from other crops such as squash and Brassicas. It does not like overly fertilised soil or soil that has been recently manured, this seems to damage the roots and you end up with lots of foliage and no tubers. Position: Ulluco loves full sun providing your summer temperatures do not regularly exceed 24c. Hotter than this your plants will suffer so you need to grow in partial shade if this is the case. This is not usually a problem in the UK! but in warmer parts of Europe it is worth noting. Watering: Another thing that Ulluco likes is water, however it likes to keep its leaves dry and its roots damp. This is no easy task, but in dry periods it is best to use a drip line hose to water the base of the plants rather than hose them from above. This helps prevent fungal diseases. The plants start to form rounded mounds of succulent leaves. You will notice different stem colour and leaf shapes between the different varieties. Keep the space well weeded while the plants are establishing. The plants begin to sprawl and will form a very dense ground cover of succulent leaves. If it is a particularly hot summer, use a drip line hose to water the base of the plants, rather than water from above. Ulluco starts forming tubers after the Autumn equinox usually around 21 September triggered by the shortening days. This is the tricky thing about growing Ulluco, the tubers start forming late in the season. You will see stolons form on the stems and these drop down to the ground and in turn produce tubers. From September through to November is the period when all your tubers will be produced and the idea is to keep the plants alive and un-frosted for as long as possible. The longer they can stay in the ground the more tubers ( and larger tubers) you will get. To help your plants you can cover with a horticultural fleece for the last few weeks of the growing season. Frost tolerance: Even though the top growth is damaged by frost, the tubers themselves can survive a few degrees below freezing and can tolerate short bursts of minus 3c to minus 5c. any colder than that you will lose some surface tubers. Lift your tubers in a similar way to potatoes but a hand fork is better than a large fork and it involves kneeling rather than bending. You will get a mixture of small, medium and large tubers. Under good conditions you can get a yield of 1kg per plant, but 200-400g per plant is more the norm if growing in the UK or Europe. Save your large tubers to re-plant the following year. With a bit of careful selection you can increase the yields and size of tubers in future years. Rotate your crop and treat as a potato in you rotation plan. Ulluco tubers are still a common part of the Andean diet and are lovely cooked like a new potato. They do not need to be peeled and have soft skins and because of their amazing colours they look incredible on the dinner table and are also high in nutrients. Cooking them in acidulated water will help them retain most of their colour. Used in soups and stews the tubers have an earthy taste and texture akin to a boiled peanut. They are better boiled rather than roasted and they can take long cooking times because of their firm texture. The leaves are also commonly eaten and are similar to spinach when cooked. Small tubers are a colourful garnish for salads and can be eaten raw. Because they contain Geosmin they have an earthy taste. The strength of the earthiness varies between the varieties. In wet winters tubers can suffer slug damage. Mice and voles will also start eyeing up your crop in early winter. Ulluco can succumb to bacterial and fungal diseases as well, so try not to water plants from above. In 2016 we had a bit of a problem with blackfly on the growing tips of our plants. This was very unusual, but if you do see any squish them off with your fingers right away and keep a close eye on the plants. 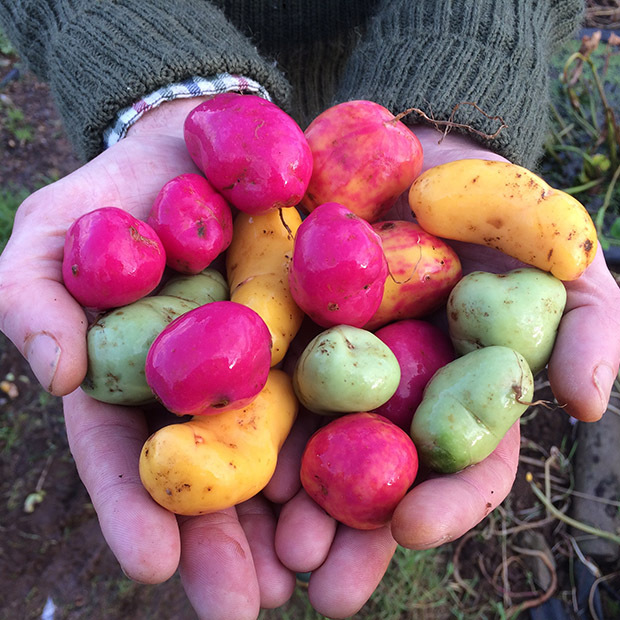 Some full size Ulluco tubers from our December 2015 harvest. The pic shows the full potential size that Ulluco can reach. Ulluco plants become sprawling and bushy over the summer – you can earth up like potatoes as this can help increase yields.